Given the complexity of current societal change, impactful action is anticipated to come from insights that span multiple academic disciplines and gain support across a range of interest groups within society. Advancing the art and practice of transdisciplinary work requires learning how to remove of institutional barriers to collaboration, the development of collaborative technologies, and dedicated staff to facilitate activities. Join us as Madhav Marathe PhD shares his experience as the inaugural Building Bridges lecturer. MADHAV MARATHE Ph.D. is the Division Director of the Networks Simulation Science & Advanced Computing (NSSAC) Division at the Biocomplexity Institute & Initiative, and a Professor in the Department of Computer Science at the University of Virginia. He is a Fellow of the IEEE, ACM, SIAM, and AAAS, and was the 2011 Inaugural George Michael Distinguished Scholar at the Lawrence Livermore National Laboratory. 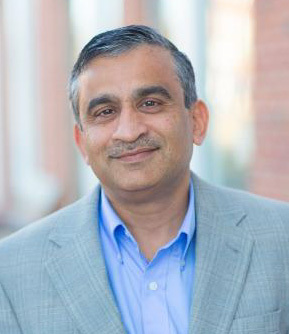 Dr. Marathe holds a BTech in Computer Science and Engineering from IIT Chennai, and a Ph.D. in Computer Science from the University at Albany-SUNY.